The NBA’s Indiana Pacers have hired Van Wagner Sports & Entertainment to sell naming rights for their arena, and the agency is seeking a partner to pay potentially more than double the deal in place at Bankers Life Fieldhouse. 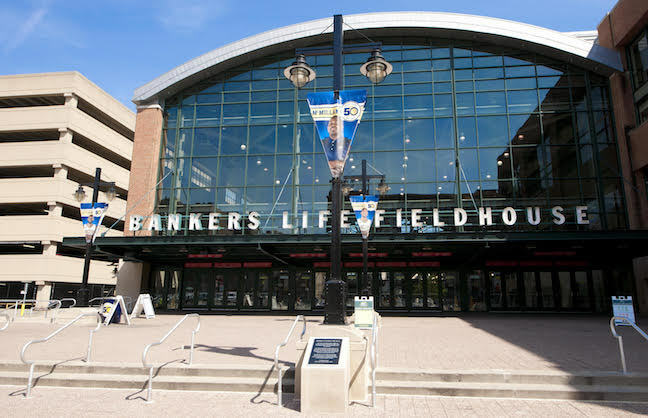 CNO Financial Group, parent company of insurance group Bankers Life, announced two weeks ago that it would not renew its 20-year, $40-million deal signed in 1999, the year the arena opened. At the time, Conseco Fieldhouse was the name of the facility. It was rebranded as Bankers Life Fieldhouse in 2011, one year after Conseco Inc. changed its name to CNO. The current agreement expires June 30, 2019, said Rick Fuson, president and chief operating officer for Pacers Sports & Entertainment, the Pacers’ parent company. Chris Allphin, Van Wagner senior vice president of team and venue services, said the situation is ripe for reselling naming rights for a building kept in top condition over the years by Pacers Sports & Entertainment, parent company of the Pacers and WNBA Fever. The arena, originally designed by the old Ellerbe Becket and built by hometown firm Hunt Construction (both now part of AECOM) for $185 million, stands out as the first retro-themed NBA venue, paying homage to Indiana’s storied hoops history. The city has gained some momentum. In addition to being named host for the 2021 NBA All-Star Game, Indianapolis continues to grow, Fuson said, and it’s on Seattle-based Amazon’s list of 20 finalists for the company’s second headquarters. Van Wagner has received multiple calls from companies showing interest in acquiring naming rights after CNO Financial Group made its announcement. The agency has had some initial talks with candidates, although Allphin would not identify the prospects. Tech firm Salesforce, which has a major office in Indianapolis and recently bought naming rights to the Chase Tower downtown, was mentioned as a potential candidate for the arena’s naming rights, according to the Indianapolis Business Journal. Salesforce is among the Pacers’ business partners, in addition to locally based Eli Lilly, plus KeyBank, U.S. Foods and others, Fuson said. Van Wagner has targeted Golden 1 Center’s naming-rights deal as a benchmark for a new deal in Indianapolis, Allphin said. In 2015, the Sacramento Kings signed a deal with Golden 1, California’s largest credit union, which is paying the team $6 million a year over 20 years. Allphin also mentioned the Milwaukee Bucks’ attempt to sell naming rights for $7 million a year for their new arena as another benchmark. To date, no deal has been signed in Milwaukee for the $525-million arena, set to open in late summer. Both arenas are much newer than Bankers Life Fieldhouse, and all three venues sit in midsize NBA markets, but the value of naming rights has escalated over the past two decades because of the growth of digital media and social media channels, according to sports marketers. Some industry experts think Van Wagner may be setting its expectations too high for a smaller-market arena that has already had two names. “There is no guarantee of that much of an increase since it is not a major market or a highly visible franchise,” said Rob Yowell, president of Gemini Sports Group. “This would also be the third name on the building, so I’d expect $3 million to $3.5 million a year for naming rights. If they are smart, they combine it with the jersey patch [which the Pacers have not sold to date] and increase the value of the package and make it more attractive." Allphin leads the sales effort for Van Wagner, assisted by Jeff Knapple, the firm’s president and CEO and among the leading brokers of naming rights. Kyle Folts, on the analytics side, and Matt Wikstrom, formerly with Wasserman, are also working on the deal for Van Wagner. Van Wagner’s recent naming-rights projects include SunTrust Park in suburban Atlanta and U.S. Bank Stadium in Minneapolis. All told, the agency has consulted on deals worth nearly $3 billion over the past 20 years, which includes agreements Allphin and Knapple worked on for other companies.